In Kemetic Orthodoxy, there are different levels of commitment to the religion. You may be a Remetj, a Shemsu, or a Shemsu-Ankh, depending on the amount of commitment one wishes to give to the religion. As a Remetj, you are considered a ‘friend of the faith’. You can perform the Kemetic Orthodox Senut ritual in its proper context, you can attend the online chats and lessons and simulcast rituals held by the clergy of the House of Netjer, and you can attend off-line events as well. 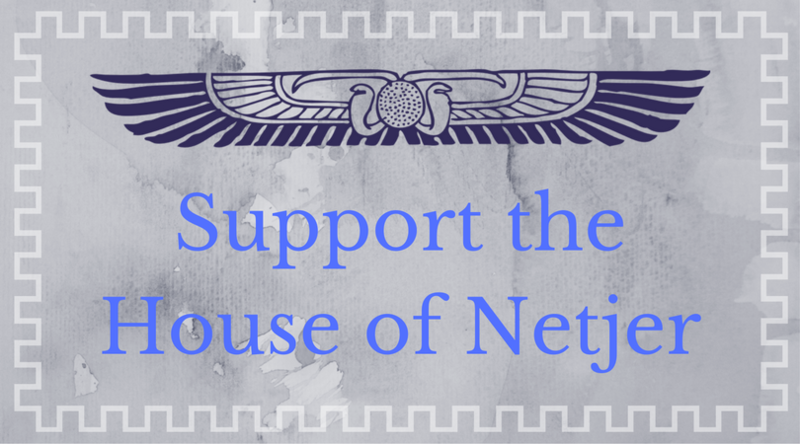 As a Remetj, you may also undergo the Rite of Parent Divination – a rite of passage within the House of Netjer. In this ritual, the deity or deities Who created an individual (Parents) and Who will be life-long teachers to an individual (Beloveds) are determined via objective (sans personal interpretation) divination, specifically by way of cowry shells. It may sound arbitrary, but the results are often shocking. 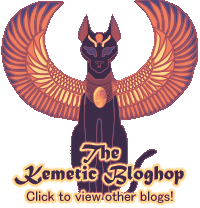 I followed Wepwawet and was close with Sekhmet, Bast and Nut long before my divination, and could have predicted the results of the ritual if I had been thinking hard enough. After this ritual, the Remetj is considered a “Divined Remetj” – halfway to Shemsu, if they so choose. Some Remetj never pass Divined Remetj. Some are happy to utilize the information given by the ritual but don’t wish to make those their primary gods, or don’t wish to make Kemetic Orthodoxy their primary religion, or don’t wish to make the commitment of Shemsuhood for other various reasons. If you do, however, wish to serve these deities first and foremost, and make Kemetic Orthodoxy your only or main religion, then you can go on to take Shemsu vows and receive a Shemsu name as part of another rite of passage. If you wish to make a commitment to serve the community, you can undergo Weshem-ib (the first of the oathbound rites in Kemetic Orthodoxy, followed by the process of becoming a priest) and become a Shemsu-Ankh. But I’d like to go back to the Shemsu for a bit. Theoretically, these positions stack. I am a Shemsu right now, and I am also a Remetj. I will be doing the Weshem-ib this summer, and following that I will be a Shemsu-Ankh, a Shemsu, and a Remetj – Theoretically, anyway. But why would you want to be a Shemsu, you might ask? It sounds like you’re giving an awful lot of your personal responsibility up. Well, yes and no. The deities Who claimed me in my divination were deities I was already close with and familiar with, and the deities I was close with and Who didn’t claim me, weren’t really appropriate for my personality. I like Them, yes, but Parents and Beloveds are involved in your life to the point where you are directly affected by Them. They mark your personality and your very being. Nit, for example. I did a lot of speaking with Nit. But Nit is hard and driving. She is fierce and stern and very imperious. Those who know me would say it would be hard to picture me serving a stern, imperious deity. I do follow Sekhmet-Mut – but that’s a different kind of fierce, one marked by passion and love – which I will discuss later – which those who know me would agree, does fit me perfectly. But even still: Why would I want to follow these gods? How did I know, when I heard the results of the divination, that I wanted to spend my time following Them? The short story: it felt right. The long answer: …I don’t know. I had known Wepwawet for some time and had been worshiping Him. I had known Sekhmet-Mut as just Sekhmet for some time, and the syncretization with Mut just made Her click. Bast was a deity that literally everyone around me said would be my Beloved, but I said I didn’t think so. Nut was the missing puzzle piece. It all just made sense. When I heard Their names read, I knew They were the gods that had been calling me from day one. I did have some time between my divination and my Shemsu naming – about 3 weeks or so. Those three weeks only reaffirmed my desire to fully follow my Parents with a strength that I can’t describe. On the surface, it all seems so simple. A woman throws shells onto a tray. She looks at the pattern. She does this about 50 times, no joke. And at the end of it all, after checking and re-checking to ensure that this is right (things have to be confirmed several times, which is amazing), she looks you in the eye (or types to you or comes back on the phone, should you do this at a distance) and says “You have two Parents and two Beloveds. Do you want to guess?” And you hold your breath and shake your head and your head spins with nerves because what if she says something you never could have guessed and you only get confirmation that the gods that you love have always loved you back, loved you so to create you and every square inch of your skin tingles with joy. Something about an objective confirmation of what you already knew, way deep down, is awe-inspiring. If you’re wondering why there were no blogs for that time, that’s why. I’ve been a little over-whelmed. As a Shemsu, it’s kind of a big deal. A big Zep Tepi, if you will. The next post: Ma’at. See you then! Next Post Standing in the Current.